Bad Weather Suspends Search For Flight 370 In Indian Ocean : The Two-Way Gale-force winds temporarily halted efforts to find the Malaysia Airlines jet as China demanded access to satellite data used to determine that the plane crashed off the Australian coast. 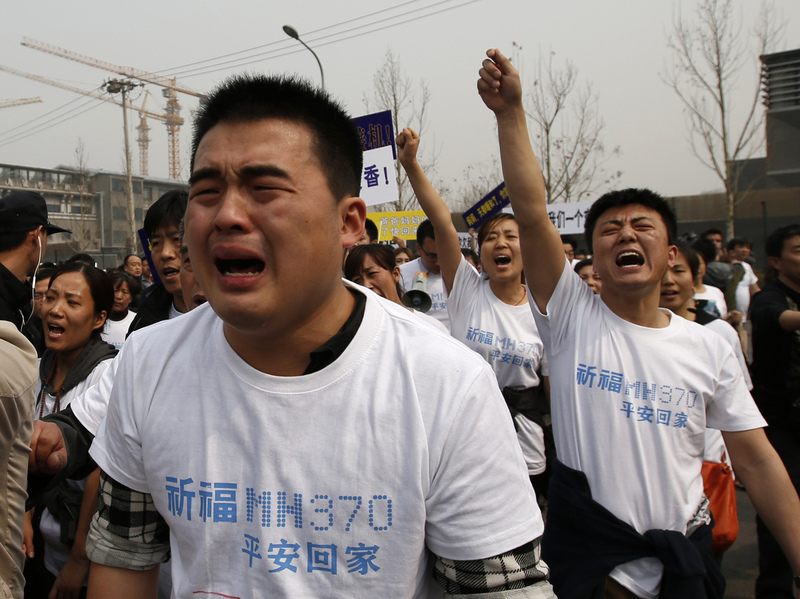 Family members of passengers aboard Malaysia Airlines Flight 370 tearfully shouted slogans during a protest Tuesday in front of the Malaysian Embassy in Beijing. Angry relatives of passengers aboard the ill-fated Malaysia Airlines Flight 370 vented their anger at Malaysian officials Tuesday as rough weather in the southern Indian Ocean temporarily halted the search for wreckage from the airliner. "Dozens of them then left their Beijing hotel on a protest bound for the Malaysian Embassy, carrying banners asking Kuala Lumpur to be truthful with the relatives." During a Tuesday news conference, Malaysia's acting transport minister, Hishammuddin Hussein, said the last signal from the aircraft was a "partial handshake" from a satellite link between the aircraft and ground station at 0019 GMT on March 8. Initially, the satellite "pings" had given searchers only a rough arc north or south of the Boeing 777's final reported position. On Monday, Malaysia's prime minister said a new type of analysis performed by the satellite company Inmarsat determined the plane followed the southern leg and that its last signal came from a position somewhere off Australia's western coast. That announcement, which concluded there must be no survivors, came as satellites and aircraft spotted debris in the same general area. But gale-force winds and heavy rain in the southern Indian Ocean have temporarily halted the search for possible wreckage. Officials hope that finding pieces of the airplane, including the flight data recorder, will provide definitive answers as to what happened to Flight 370, which was en route from Kuala Lumpur to Beijing with 239 passengers and crew when it went wildly off course. The weather was expected to improve by Wednesday, allowing planes to resume their search of an area about 1,550 miles southwest of Perth, Australia, but the delay could cause debris spotted earlier to drift from the immediate search area. Beijing, meanwhile, is demanding that Malaysia turn over the satellite data used to conclude that the jetliner took a southern route and crash-landed in one of the remotest stretches of ocean in the world.